When it comes to camcorder, it may spring to mind when you think of shooting some exhilarating videos to memorize special moments in life, especially with the high quality videos now available. But what if you would prefer to import these wonderful camcorder videos to your iPad for playback and share them to others conveniently? You may suffer from failure due to compatibility issue of video formats. This is because nearly all camcorders record videos in MOD, TOD, MTS, M2TS formats, which are unplayable on iPad that only supports videos like MP4, MOV, etc. For the sake of playing camcorder video on iPad, you need to convert camcorder videos to iPad friendly format first. To solve the problem, a video transcoder can do you a favor. However, with so many tools mushrooming in the market, they are a far cry from each other in terms of feature and effect. Well, I made a google search and luckily found that MacX Video Converter Pro enjoyed great popularity among customers thanks to its easy-to-use interface, which works like a charm to transcode camcorder videos to iPad (iPad Pro/mini 4/Air 2 included) on Mac with fastest speed (due to hardware acceleration tech) while holding superb video quality. Besides, this app also features in transferring any videos to MOV, MP4, Music, etc. No.1 camcorder to iPad video decoder to change camcorder MTS, M2TS HD videos to iPad (iPad Pro/Air 2/Mini 4 etc) with the fastest speed and untouched quality reserved! After download this iPad video processing utility on macOS (Mojave incl.) or Windows version (Windows 10) on your computer. 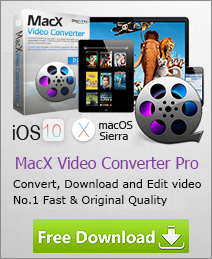 Click the "Add File" button to import camcorder video that you want to watch on your iPad. Select the output video you desire. In this tutorial, we choose "to iPad". This software supports all types of iPad, including the latest iPad Pro/Air 2/mini 4. 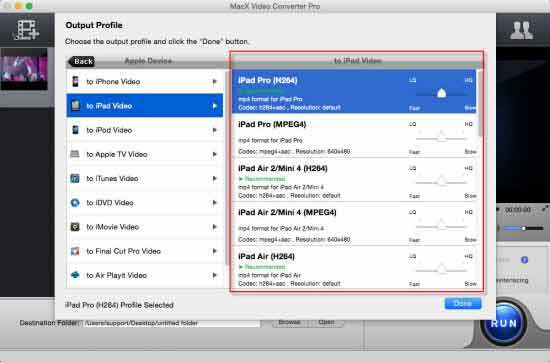 After finish the above steps, click the "RUN" button to start conversion from camcorder video to iPad, you could view the conversion progress and are able to cancel the converting process at anytime.